How To Create a Hipster Logo? The hipster subculture brings together young people interested in alternative music, indie rock, art house, modern literature, and fashion trends. It’s a whole world that can offer a fresh approach to many important things. People calling themselves “hipsters” deny capitalistic profiteering and put spiritual development above material wealth. It’s worth noting that unlike hippies, hipsters don’t deny worldly blessings or spend hours meditating. At the same time, they value beautiful art-related things and celebrate the creative potential of the mankind. 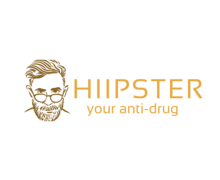 The best way to craft a visually appealing hipster logo is to create a fusion, i.e. combine incompatible design elements. The ability to think outside the box is critical to crafting a memorable design. Refresh your logo with scrolls, whirls, and unusual patterns. Steer clear of straight or zigzag lines. When it comes to colors, there are no rules. Feel free to use any shades, from pink to brown. If you’ve been wanting to experiment with shades for a while, this is your chance! Become the creator of your own color scheme! Converse, Levi's, Pabst, Bulleit Bourbon, and other major companies are the great examples of how you can spice up your brand personality with hipster vibes. How do I create a hipster logo for my brand?